This post may seem out of character – not my usual literary fiction or nonfiction fare. I don’t read a lot of fantasy but I’ve actually loved Terry Pratchett’s Discworld novels since I discovered them back when I as in middle school in the 90s. I have fond teenage memories of reading the books either alone in my childhood bedroom or aloud to my kid brother as he feel asleep at night. I find the Discworld novels to be appropriate for all ages, kind of like those children’s movies that have more risque jokes in them that kids don’t get but that their parents do. As an adult, I’ve enjoyed rediscovering Pratchett’s novels – their elevated humor and complex satire. I thought I’d share my love for his works with you by providing reviews of my 6 favorites. The Discworld series is a comic fantasy book series set on The Discworld, a fictional land made up of a disc which rests in space on the backs of four elephants, who themselves stand on the back of the giant turtle the Great A’Tuin. The series is essentially a satire or parody of human history, with a strong dose of magic and fantasy thrown in for good measure. Some of the topics or themes present in many Discworld novels include elements of fairy tales, witches and vampire stories, as well as parodies of religion, business, politics, major historical events, and trends in science, technology and pop culture. Though many of the novels were published in the 80s and 90s, they hold up to the test of time and don’t feel dated to the modern reader. Each of the novels can be read independently, as a stand alone self-enclosed story. However, there are several story arcs dealing with specific characters and events that weave through some of the novels. Mort (short for Mortimer) is a young man who finds himself with no apprenticeship offers except for one from a very unexpected source – Death. With no other offers on the table, Mort has to accept, and he soon discovers being Death’s apprentice isn’t such a bad deal. When he falls in love with a princess who is destined for the underworld, bumbling Mort realizes he may have a slight problem on his hands. This is definitely one of my favorite Terry Pratchett novels. The character of Death is, believe it or not, laugh out loud funny. When you’re the grim reaper, you have to have a sense of humor, even if other ‘people’ may not be in on the joke. Death appears in nearly all other Discworld novels for more or less brief segments, but in this book you get to know the real Death through Mort’s eyes, domestic life and all. This is the perfect novel to pick to be introduced to Pratchett’s witches, who are not your usual witches. Though they are perfectly capable of using magic, they prefer to resort to the finer and more effective art of psychology (or as they call it ‘headology’) in manipulating others and the circumstances around them. In Witches Abroad, young witch Magrat Garlick inherits her wand after another witch’s passing, and with it a mission to travel to the enchanted city of Genua and stop a princess from entering into an unsavory marriage. Veteran witches Granny Weatherwax and Nanny Ogg join her on her journey and with these two characters on board, hijinxs inevitably ensue. For more witch tales from the Discworld, be sure to also check out Equal Rites, Wyrd Sisters or Maskerade. In Small Gods, Terry Pratchett obviously tackles religion. The gods of the Discworld are fated to take on more or less imposing forms depending on how many followers they have. That is how the once powerful god Om finds himself manifested in the body of a tortoise, and has a hard time convincing the only true believer in him – the novice Brutha – of his godliness. In the land of Omnia, the Quisition, led by deacon Vorbis, tortures people for saying they do not believe in Om, but that has resulted in most citizens pretending to believe in Om out of fear or simply out of habit. The adventure that Brutha and Om embark on together to see the god reinstated will change both of them, while providing a sharp satirical look at churches, Gods, their believers, human nature, tolerance and friendship. Small Gods doesn’t have many of the Discworld’s most popular characters, but in the masterful way in which it deals with the difficult topic of religion, it may be my favorite. Captain Samuel Vimes of the Ankh-Morpork City Watch (first introduced in Guards! Guards!) is retiring due to his impending wedding to noblewoman Sybil Ramkin. He is to be replaced by Captain Carrot, a tall and strapping young man who was adopted into a dwarf family as a baby. There are several changes going on in the City Watch, including the inclusion of the first female (werewolf) member and the addition of an actual dwarf and a humongous troll. When an assassin – Edward d’Eath – steals the Disc’s only handheld firearm, The Watch is tasked with ending the dizzying series of murders that results. In Men At Arms, Terry Pratchett skillfully deals with such hot-button topics as gun ownership, racial discrimination, interracial romance, diversity in the workforce and legitimacy of rule. All while making the novel laugh-out-loud funny. There’s a delightful guild of sad clowns thrown in there as a bonus. Interesting Times was my first introduction to what I think is The Discworld’s principa and funniest character (and that’s saying a lot) – the wizard Rincewind. I then went back and read prior novels like The Colour Of Magic and The Light Fantastic in which Rincewind is first featured. Rincewind is a wizard in name only. He has no skill, no qualifications, and no desire to embark on feats of bravery. His primary qualities are an uncanny ability to stay alive even in the most dangerous situations, and an equivalent uncanny ability to get himself and others into trouble. In Interesting Times, Rincewind is inevitably picked as Ankh-Morpork’s emissary to the Agatean Empire on the Counterweight Continent (which looks suspiciously like dynastic China). Rincewind is joined by the elderly Cohen The Barbarian and his Silver Horde, and together they become embroiled in the downfall of the Agatean Empire. I think I like this Discworld novel in particular because it’s set on The Last Continet of Fourecks, which looks suspiciously like Australia, and I studied abroad in Australia during college. In The Last Continent, Rincewind finds himself marooned on Fourecks, where a talking kangaroo tells him he’s fated to complete the continent’s creation by making it rain there for the very first time. Rincewind, as usual, is none to pleased to be on yet another mission. In the meantime, a motley crew of extremely funny wizards from Unseen University in Ankh-Morpork embarks on their own quest to find Rincewind. He is the only one who knows the name of Unseen University’s librarian, a wizard in orangutan form who is now plagued with an ailment that can only be cured by knowing his name. As the librarian falters, the magical books in the University’s library start to rebel. Will the Wizards find Rincewind in time to cure the librarian, and will Rincewind finally make it rain on poor Fourecks? Sir Terence “Terry” Pratchett was an acclaimed British author of fantasy novels who created the popular Discworld series which comprises 41 novels. Pratchett was an extremely prolific writer throughout his life, writing an average of 2 books per year. The first Discworld novel – The Colour Of Magic – was published in 1983.His final Discworld novel, The Sherpherd’s Crown, was published in August 2015, five months after his untimely death. Suffering from early-onset Alzheimer’s, he advocated for increased funding for Alzheimer’s research up until his death in March 2015 at age 66. Pratchett remains one of the UK’s bestselling authors of all time, with 85 million books sold worldwide in 37 languages. Have you read any of Terry Pratchett’s novels? Which is your favorite? 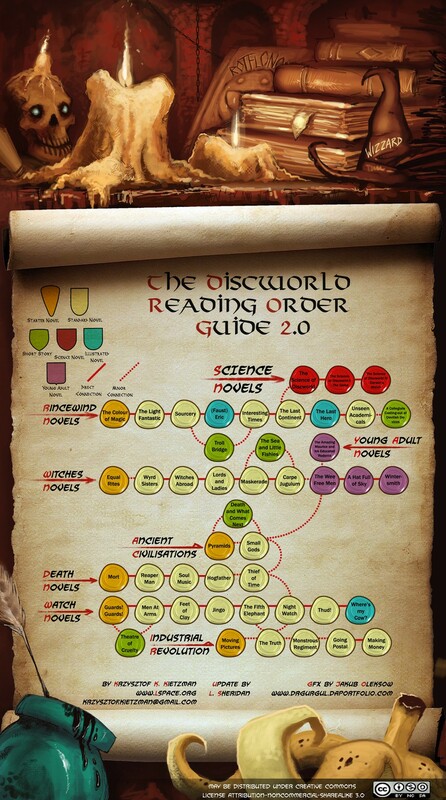 If you’re going to embark on reading the Discworld novels, you may want to consult this handy guide which shows you how to read them in an order that makes sense by theme and principal characters rather than in the order of publication. I have long since looked at the Discworld novels with longing, but I have never read any of them. I adore Good Omens, and I am pretty hit-or-miss when it comes to Niel Gaiman, so I knew my love must be with Pratchett. However, I am intimidated! There are so many books! Where do I start? With The Colour of Magic? Or somewhere else? Hmm where to start is a hard question. I would start with Interesting Times. It’s a good Rincewind intro and better than the first two novels in my opinion, though they are good as well.